I made some financial goals in 2018 and I met some of them. First of all, I paid off my student loans! I am still excited about this, even many months later. 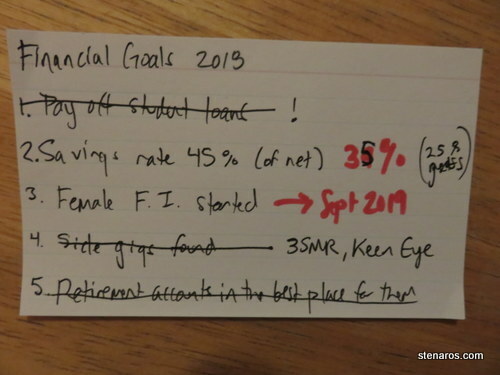 I had a rather ambitious savings rate goal, which I did not meet, partially because Oct–December I funnelled any extra money (including birthday money) into starting my business. But 35% of my net pay is nothing to sneeze at. I did not start the financial independence blog. I thought I was going to take two months (September and October) and get both the 3SMReviews blog and the financial independence blog launched, and I was very wrong in that thinking. My new goal is to start in September 2019, when I’m more settled in my 3SMReview production schedule. I did find some side gigs. I’m starting a copyediting business and I’ve got 3SMReviews on its way to making money, though that might be a slow process. I also learned what I don’t want to do for side gigs, which are gig economy things that throw me out of my routine (charging scooters, doing store audits, stuff like that). I’m happy to come home from work at the same time every day and work at my desk for two more hours. What I don’t like is random things popping up here and there. Basically, everything that Financial Panther does, does not work for me. I’m glad that I learned that. “Retirement accounts in the best place for them,” was code for “Should I move my money match money out of the PERS system?” I have decided not to do that at this time. We shall see if that was a wise decision. You must feel like a millionaire. No student loans. Hurray! Next Next post: Baby Blanket Finished!